Sepia-toned image of the front of a building. About a dozen men and one boy in overalls stand on the boardwalk or planked road in front of the two-story building. Several store fronts with recessed doors and squared framed windows take up the first floor beneath a recessed awning, while the second floor features square bay windows. An upper pediment on the roof reads 'Woods [and] Caples, 1893.' Four bikes are visible, two parked up against the front of the building, one against the side, and another leaning against the edge of the boardwalk. Signs indicate a doctor's office and a dentists' office are on the second floor, while a blank slate on the far side of the building reads 'Washington County Mills' on the top. [front] [pencil] Fred Watrous. 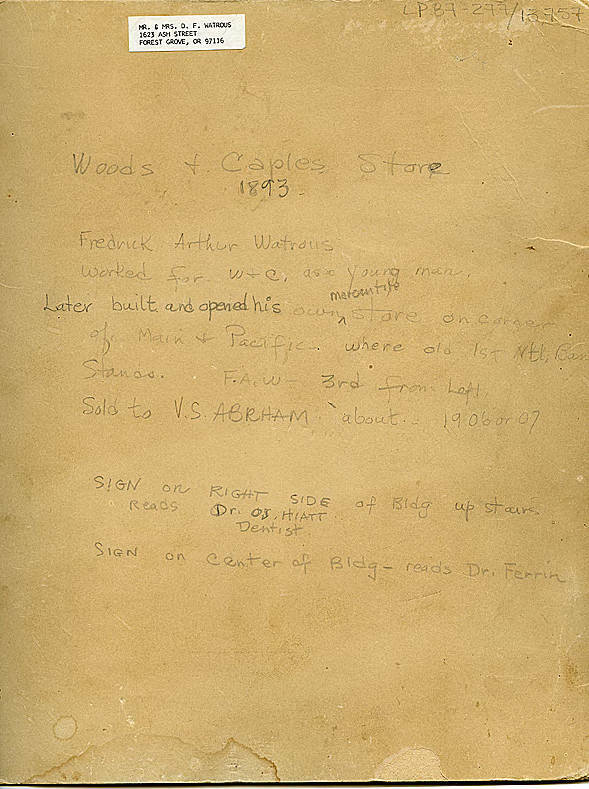 [back] [pencil] Woods & Caples Store, 1893. Fredrick Arthur Watrous worked for W&C as a young man. 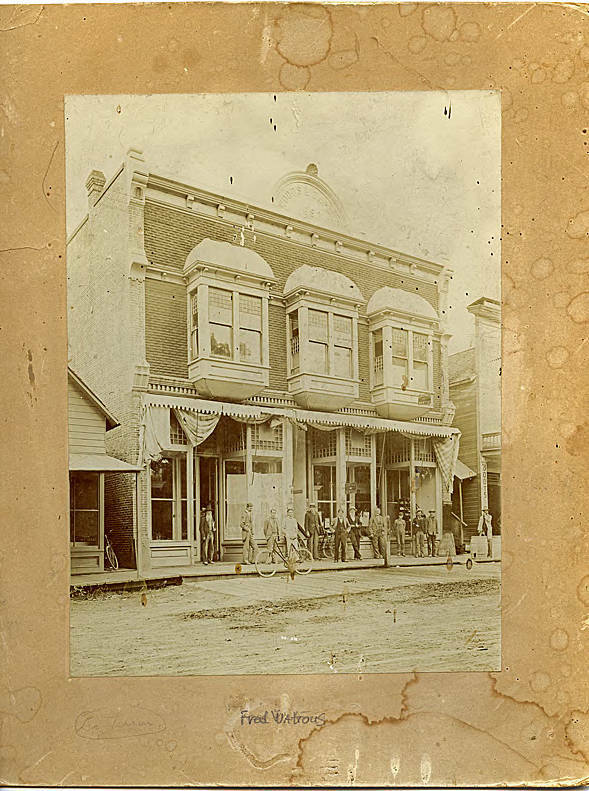 Later build and opened his own mercantile store on corner of Main & Pacific where old 1st. Ntl Bank stands. F. A. W. - 3rd from left. Sold to V. S. Abraham [sic] about 1906 or 07. Sign on right side of building up stairs reads Dr. O. S. Hiatt, Dentist. Sign on center of building - reads Dr. Ferrin. [label] Mr. & Mrs. D. F. Watrous [address redacted] Forest Grove, OR.